Design a product or service that addresses mental health while considering emerging technologies such as connected experiences (IoT), Machine Learning/Ai, and immersive reality. Provide user value differentiated from competitors that has a strong brand point of view. 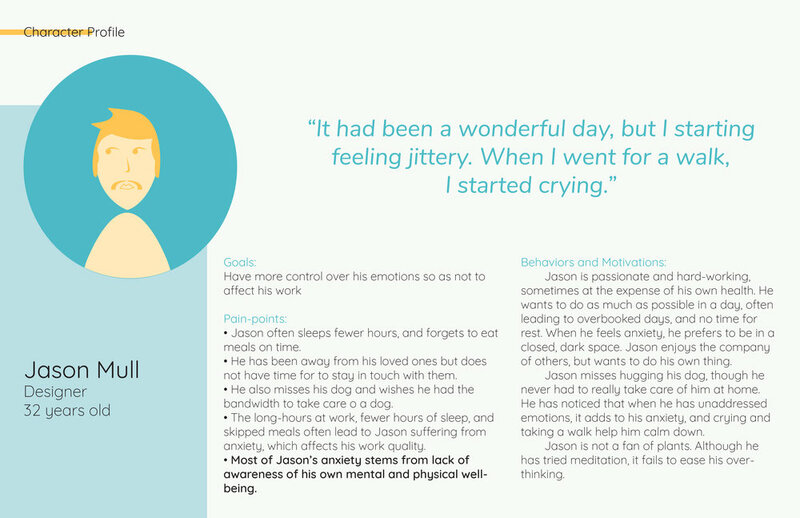 Bloom is a connected device service to help working professionals and higher education students deal better with General Anxiety Disorder. Bloom empowers individuals to develop rituals around different coping mechanisms, to help them manage their anxiety proactively with the help of a wearable, a succulent planter and an application platform. In February 2018, I had an anxiety attack. I didn’t even know it at the time, nor did I have the coping tools to manage the emotional spiral I had. Some preliminary research revealed that many existing digital services were addressing anxiety through mindfulness-based exercises such as meditation. However, none of them were helping me prepare better for this situation next time - they were temporary reactive exercises. Competitive Landscape of existing digital services addressing GAD. I conducted interviews with individuals to familiarize myself with how they manage their anxiety, and might be preparing for future anxiety attacks. The data gathered from my interviews inspired many of the service solutions. Once I had identified the key use cases for the Bloom service, I conducted usability tests with simple paper prototypes to validate them. This helped me develop the design stories and task-flows to clearly differentiate the features in desktop and tablet versus mobile. This was crucial to design the user-flow and wireframes. The final step was to combine the branding with the functional design, resulting in an interactive mobile prototype, and static UI for the desktop and tablet. Bloom Ring, a wearable that tracks ‘Anxiety Levels’ (see case study), and provides haptic feedback in case anxiety levels are rising, providing real-time feedback. Bloom Planter, a plant pet vase that guides breathing exercises with the help of glowing LEDs and is equipped with sensors to re-assure users of their plant’s health. Bloom Application Platform, an ecosystem of apps across devices to empower users to perform various tasks, form rituals and track cognitive dissonant language for a more positive approach to manage anxiety. This project was a great learning experience specifically in terms of Functional design and Brand design. The process was highly iterative. Experiencing anxiety first hand, was what led to this project. I hope that it becomes a reality soon - having a self-care service would be really beneficial especially in high stress environments such as a Masters program! I envision the Bloom service would expand to involve pets such as cats or dogs to be trained as part of the service, for individuals who may not feel much for plants. The most enjoyable aspects for me were the usability testing, along with systemic design decisions involved. I look forward to conducting more usability tests with the digital prototype, and develop the form for the ring and planter. I am also excited to create a 'Wizard of Oz' prototype of the planter and ring, and conduct Diary Studies to get feedback on the entire service experience.